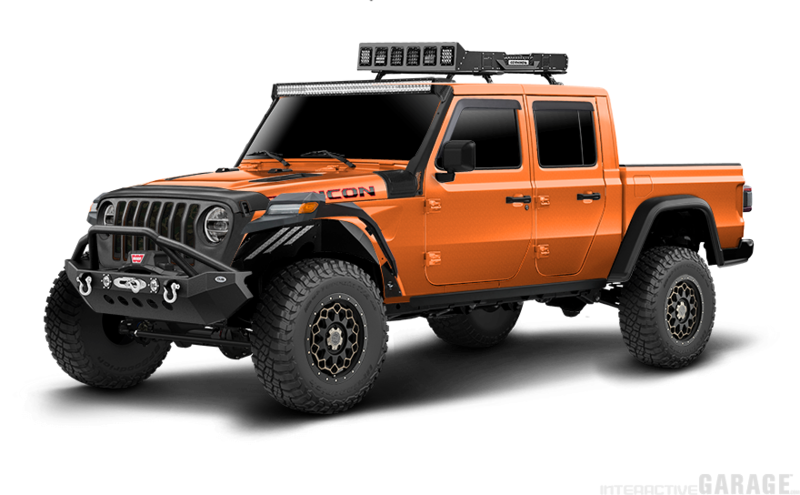 The second coming of a long awaited unicorn from Jeep is now weeks away from hitting the dealership lots, the 2020 Jeep Gladiator JT. 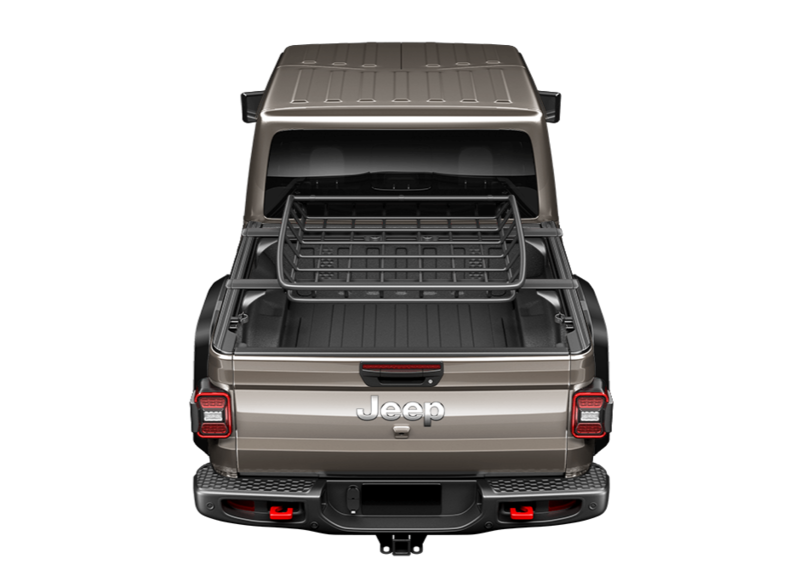 Interactive Garage™ is proud to be the first online vehicle configurator to have the JT available for you and your customers. Jeep and the Mopar® parts crew have once again kept a tight lip on the actual parts that will be in production for the JT, not to mention keeping the aftermarket in the dark as far as any pre-fit opportunities for rear bumpers, lift kits, running boards, etc. As the mad scramble to get their hands on the first round of JT’s out of Detroit, rest assure as soon as accessories are released for the JT we will have them up and running on Interactive Garage. Until then we highly suggest you enable this vehicle in your program as there are still hundreds of active SKU’s available to configure on the JT. 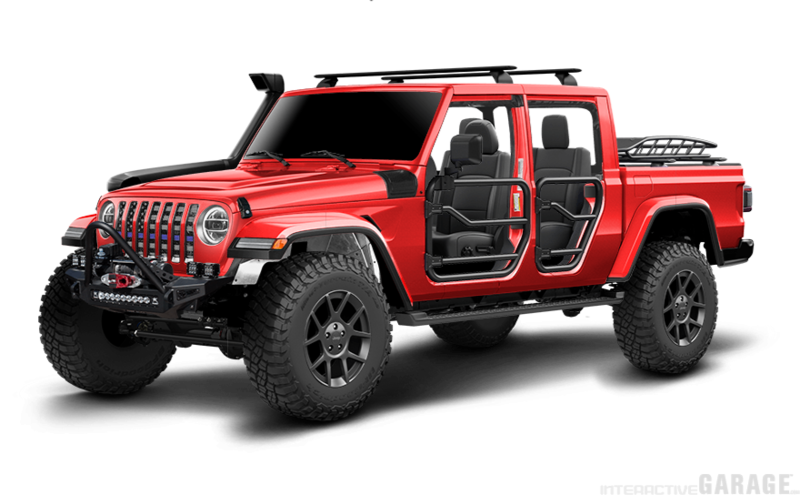 Front bumpers, grill inserts, hood protection, lighting options, wheels, tires, tube doors and much more. Plenty of accessories both OE and aftermarket to get those creative juices flowing from you and your customers. Many of you have inquired about getting various logos, exploded vehicle images and web banners that you have seen us use on our own website and throughout social media. We’ve compiled those assets for you to use in your own marketing around your Interactive Garage™ program and can be accessed through the links below. 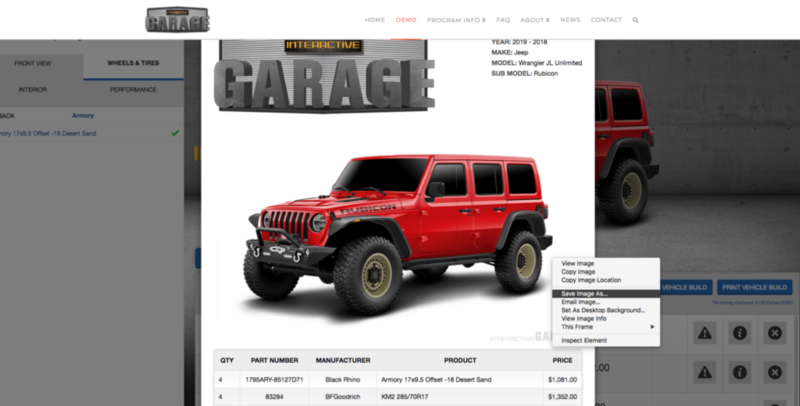 – Go to your own Interactive Garage™ program, build up a vehicle and select the “Print Cart” button. – When the pop up promps your printer you can also choose to “SAVE AS PDF”. 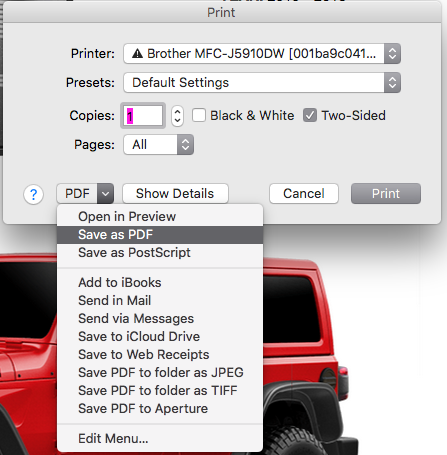 Save that PDF to your desktop, open it back up in what ever image preview program you use you can crop out everything other than the image of the vehicle. – Another option, when the print screen overlay comes up, you can right click and do a “SAVE IMAGE AS” on the image itself. Just a few helpful hints on how to best promote your Interactive Garage™ online or at your location. Need anything else, don’t hesitate to call or email anytime. All products added to the Interactive Garage™ Software program are the property of the vendors / manufacturers that produce the products. RCH Designs, LLC does not give nor have the right to sell, distribute or authorize the use of said products to any user of the Interactive Garage Software Program. All users of the software must make their own arrangements to sell and/or distribute said products with the vendors / manufacturers directly. If you don’t see a product category that fits what you manufacturer, please call us @ 435-879-8208 to discuss, or email ryan@rchdesigns.com. The software has no limitations, adding new product categories or sub categories is just a mouse click away.